Anna Daroch violinist - daroch-trios Jimdo-Page! Anna Daroch was born in Lodz/Poland into an artistic family. She began her musical education as a violinst at the age of 6 at Wieniawski Music School in Lodz. In 2002 she graduated with distinction from the Lodz Bacewicz Academy of Music in the class Prof. Iwona Wojciechowska. She is also a holder of the Soloist Diploma/Konzertexamen from Hochschule für Musik und Theater in Rostock in Germany under Prof. Liviu Casleanu. Anna Daroch has participated in a number of solo, chamber music and orchestral festivals in Europe and USA. Anna Daroch has worked with the Polish Camerata, Arthur Rubinstein Philharmonic Orchestra, Mannheimer Kammerphilharmonie, Mannheimer Phil- harmoniker, Idyllwild Music Festival Orchestra (as a concert master performed at Walt Disney Concert Hall in Los Angeles). Currently she is working with Philharmonisches Orchester Freiburg in Germany under the direction of Fabrice Bollon and guest conductors such as Donald Runnicles, Kszystof Penderecki, Gerhard Markson, Marek Janowski. In 2007 and 2010 she performed as part of the Ensemble Modern Orchestra in venues including the Baden Baden Festspielhaus, Alte Oper Frankfurt, Amsterdam Concertgebouw and Salle Pleyel in Paris under the direction of Pierre Boulez and Peter Eötvös. 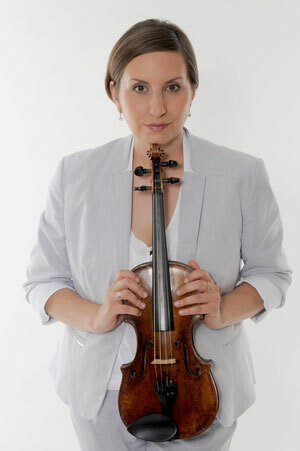 Since 2008 she has held the position of Violin Professor at the Specialist Music School in Freiburg in Germany. In 2010 Ms Daroch also received the European Diploma of Culture Manager from Association Marcel Hicter pour la Democratie Culturelle.